$10 flat rate shipping on orders under $100 to Canada and the US! 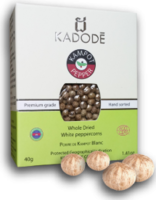 Kampot Pepper, a gourmet pepper sought after by chefs around the world, comes from the region of Kampot on the south coast of the Kingdom of Cambodia. Nestled between the mountains and the ocean, the region boasts a pepper growing history that dates back 400 years, a unique soil, and a rainy, humid climate perfectly suited for producing outstanding pepper. 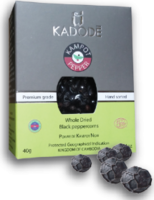 From the moment you try Kampot Pepper, you’ll understand why it’s considered far superior to the peppers produced in Vietnam and India. Produced from two varieties of plants, it is extremely versatile in its flavour, ranging from mildly sweet to intensely spicy, with an unmistakable aroma that’s sure to arouse and delight the senses. With our supplier, FARMLINK, we are working together to support Cambodian farmers by providing them with access to new, global markets and helping them with methods to increase their productivity, all with an aim to revive Cambodian industry. Kampot Pepper has also been designated a Protected Geographical Indication (PGI), which is extremely rare for a spice, and also carries the ECOCERT certification. The PGI designation dictates which plants from the Kampot region must be used to produce Kampot Pepper, which ensures a high, consistent quality. And ECOCERT has become a benchmark in organic certification worldwide. It’s hard to beat 400 years of pepper growing history and the vast knowledge that has passed from generation to generation. The painstaking methods these farmers employ ensure that you get the highest quality pepper possible, for use in your recipes or on your table. Each ripe pepper berry is first handpicked, and only the very best of those berries is selected. They are sundried, cleaned and then go through a rigorous sorting and grading process – again, all done by hand to ensure the highest standards are maintained. From there, they are carefully stored to preserve the pepper’s unique aroma and flavours. It’s that unique flavour that sets Kampot Peppers apart. Together with the slightly fruity aroma, they offer a relatively sweet, pungent taste that mingles in your mouth and excites your taste buds. Discover for yourself why Kampot Peppers are considered one of the best peppers in the world. Kampot peppers stand out by their unique flavour. They develop a relatively sweet pungent taste, fruity aromas and an exceptional flavour in the mouth. Kampot pepper is reputed to be one of the best peppers in the world. 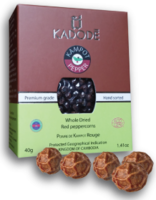 Questions about our pepper products or how to place an order? We would love to hear from you!